PDF 417 is perhaps the best known multi-row stacked linear symbology. It has been used for a long time in many applications, such as drivers’ licenses, airline boarding passes, and shipping labels. The design of PDF417 provides for the symbol being “line scannable”. 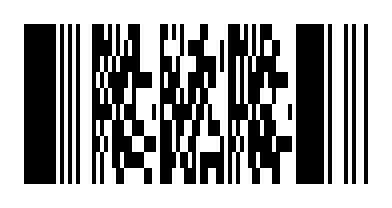 First of all, each row is composed of self-clocking characters, much the same way as an ordinary linear bar code. The ‘417’ in the name of the symbology comes from the structure of each character. It is 8 elements (4 bars and 4 spaces) arranged within 17 unit modules. (The ‘PDF’ part of the name stands for ‘portable data file’ and suggests that the data capacity of the symbol is large enough to represent all of the data associated with the item that the label is on, as opposed to a number that refers to a record in a non-portable data file (such as a price look table) in a computer database. Each row can be read in a way that is similar to the process of reading a linear bar code. However, each row further contains a special character at each end (adjacent to the start and stop characters) which identify the row number within the symbol for this row. There is also other information in these special characters, including the total number of rows and the total number of columns in the symbol. In this way, a scan of a PDF 417 symbol can yield part of the decode information of the symbol which can be combined with other scans (of the other rows) to result in a complete decode. Thus, PDF 417, like other multi-row stacked symbologies, are “line scannable”. It is not necessary to get a picture of the whole symbol in a two-dimensional image to read a PDF 417 symbol, as it is for matrix symbologies. To verify PDF 417, learn more about Webscan’s PDF 417 Verifiers.